Holiday.gr - Naoussa, a trip to a myth! 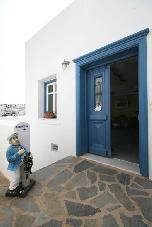 Naoussa that used to be a fish village is located in the north part of the island 10km from the capital. It is built around a beautiful, safe, little port. 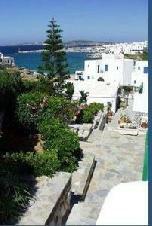 This graphic port is a real ornament for the island and for many people the best spot in Aegean Sea. The beautiful town of Naoussa due to its authentic beauty of Cyclades Islands and its natural beauties is the number one summer destination for Greeks and foreigners. Everyone is charmed by its glow and want to extend their staying. Naoussa turned to be a crowded summer resort. There are a lot of hotels and tourist operations in the island. A stroll in the traditional settlement of Naoussa can be a unique experience. As you walk in the narrow, with pebbles, paths and see the structure of houses and churches, you realize the exceptionality of the beauty of Cyclades. During your staying in Naoussa don't forget to visit the Laographic museum and admire an excellent collection of traditional costumes and the Byzantine and Metabyzantine museum that hosts important exhibits. 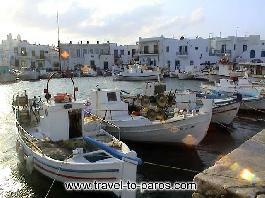 The best spot in the town is the small port with fishboats waiting for their captain to sail. In its entrance is located the Enetic castle built in the 14th century. Around the port there are old fish storehouses that now have turned into bars, taverns and restaurants. The heart of the town beats there every night. Locals and tourists entertain in the same spots and as the night goes by they become one and dance in the rhythms of the local music. From Naoussa you can easily approach the most famous beaches of the island. The closest to the village are those of Agii Anargiri and the consequent beaches of Small and Big Pepper. South of Naoussa is located the most famous beach of the island, Kolibithres. Its carved rocks look like a natural sculpture. Its name is due to this peculiar shape. Surrounded by rocks makes a natural baptizing tub. It's one of the best-organized beaches of the island. Been to Naoussa ? Share your experiences!